A Year of Being Here: Arthur Sze: "The Unnamable River"
worker, pulverized in the grimy hands of a railroad engineer? ashore, dormant in a volcano along the Rio Grande? to its source and never find it. But it's in the capillaries of your lungs. It's in the space as you slice open a lemon. in rain splashing on banana leaves. have pneumonia to sense its crush. But it's also in the scissor hands of a clock. but who can step out of his body to compare the two? the Milky Way flow out of his hands? that is all we know of it. It turns black and hard, a corpse on the Ganges. flow as you feel the surge and flow in your own body. is a form of existence that gathers and spins death and life into one. river river river, river river. The coal miner may not know he has it. The steel worker may not know he has it. The railroad engineer may not know he has it. of an avocado blossom, and in the true passion of a kiss. 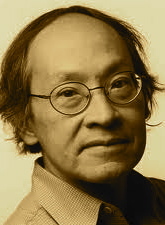 "The Unnamable River" by Arthur Sze, from The Redshifting Web: Poems 1970-1998. © Copper Canyon Press, 1998. 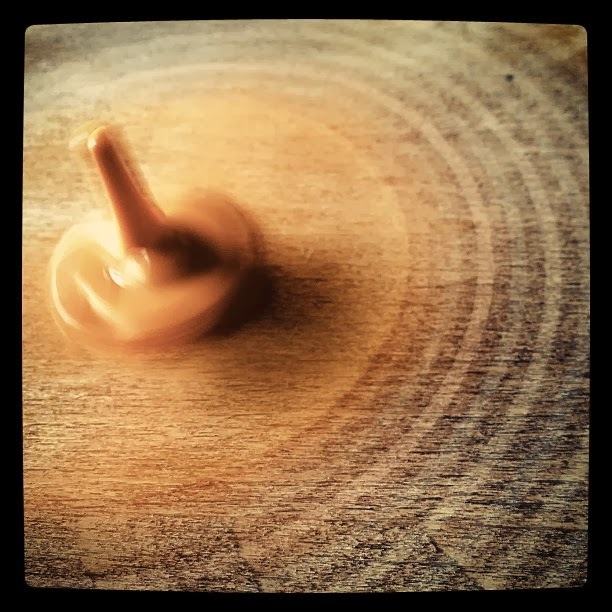 Photography credit: "Spinning Top," by David, Bergin, Emmett and Elliott (originally color).